ROME (CNS) — Christians have the teachings and the responsibility to address growing fear of and discrimination against immigrants and refugees, said speakers opening a Vatican-sponsored conference. The cardinal was one of three speakers giving opening remarks Sept. 18 at a conference in Rome on “Xenophobia, Racism and Populist Nationalism in the Context of Global Migration.” The gathering Sept. 18-20 was jointly hosted by the Vatican dicastery and the Geneva-based World Council of Churches in collaboration with the Pontifical Council for Promoting Christian Unity. 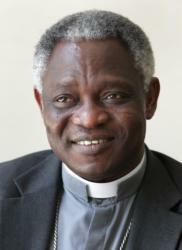 Cardinal Turkson said the conference was looking at how communities view, receive and integrate foreign migrants. “All churches and their members have the responsibility and the mission to promote the objective understanding of human dignity, human rights, social cohesion and integration as an essential instrument for building an inclusive, just and peaceful society,” Bishop Farrell said. “The love of Christ includes the obligation to affirm the life and livelihoods of people and not to create the disasters of violence and war that force people to flee and to migrate,” he said. “The love of Christ requires us not to succumb to racism but to resist exclusion based on fear, the fear that fuels xenophobia and exclusive nationalism.